However, the business and premises at 92 High Street have been on the market for several years with a guide price of around £100,000. It has also gone under the hammer and failed to sell. And now, owner Shabaz Ali, who has manned the till since 2011, has decided to close the store without finding a buyer. 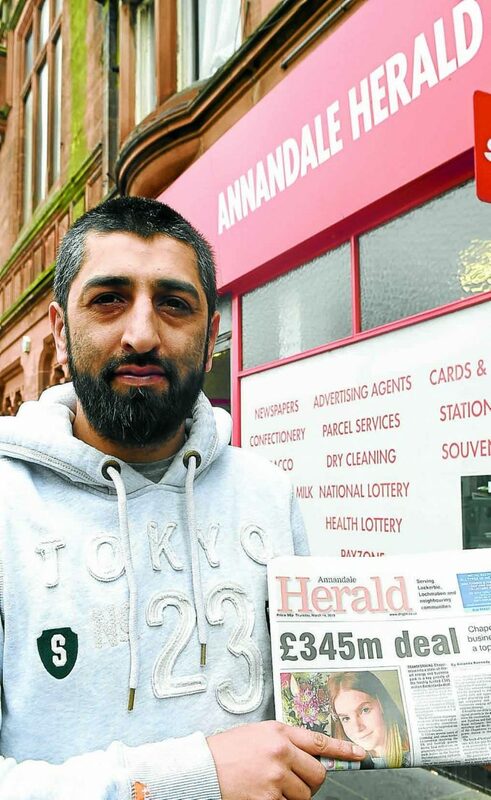 He had hoped to sell or rent the it, keeping the iconic Annandale Herald newsagents open, but alas there have been no takers. Yesterday, he said: “It’s been a pleasure serving Lockerbie over the last eight years, and I will be sad to leave it behind. Mr Ali is moving away from the area to be closer to his young son and wife. The shop’s imminent closure is a blow to the town and surrounding communities. It comes on the back of most newspaper sales being withdrawn from neighbouring Lochmaben, as shops close or cancel contracts with newspaper suppliers. However, Karen Wilson of Wilsons’ Newsagents in Lockerbie has offered reassurances that they will be stocking extra copies of the Annandale Herald. Meanwhile she is also encouraging anyone who gets their newspaper delivered to get in touch. The Annandale Herald can also be picked up at Tesco, Spar, Applegreen Garage and in towns and villages across the region.